Christendom College began its spring semester on Tuesday, January 15, with an opening address from college president Dr. Timothy O’Donnell. 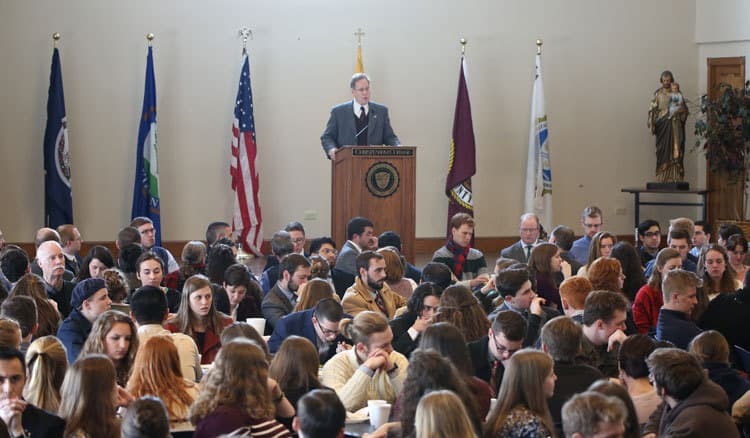 In his address, O’Donnell announced all of the spring’s exciting events, including this year’s commencement speakers, and encouraged students to boldly follow Christ while further developing the educational apostolate that is Christendom. Looking forward to graduation in May, the class of 2019 will be the college’s largest graduating class ever. At their commencement exercises, the 130 graduates will welcome three special guests to campus: Fr. Robert Spitzer, Dr. Janet Smith, and Bishop Michael Burbidge. Fr. Spitzer will be awarded the college’s Peter Canisius Award, while Smith will be given an honorary doctorate. Bishop Burbidge of Christendom’s home Diocese of Arlington will celebrate the college’s Baccalaureate Mass. O’Donnell also revealed that progress is being made in the planning of the construction of the college’s new Christ the King Chapel Project, following the successful raising of all funds for it this past fall. The college received approval from the Department of Environmental Quality over the college’s Christmas break, moving it one step closer to beginning construction. The college will welcome many exciting speakers this spring as well, including Sister Joseph Andrew, O.P., on March 20th for an Outside the Box event and Mother Olga of the Sacred Heart on March 25 for Christendom’s spring Major Speaker event. The college’s alumni networking series, “Life on Tap,” will continue also, featuring successful alumni speakers in the fields of law, software development, non-profit think tanks, and communications. In February, Christendom will welcome twenty presidents from Catholic universities across the country for the Ex Corde Ecclesiae Presidents’ Roundtable. The special event will give the presidents the opportunity to reflect on how to strengthen the Catholic identity of their respective institutions, all under the spiritual direction of Fr. Giertych, theologian for the papal household. On campus, a new tutoring center is now open for students in the lower level of the St. John the Evangelist Library, giving them the opportunity to grow stronger in their study habits and grasp of complex topics throughout the academic year, and a new internet café counter is also complete on the lower level, providing students with another area to work on papers and do research on campus. Concluding his address, O’Donnell exhorted students to shine like candles in the darkness throughout the semester and beyond, providing a light to the rest of the world.